What were you doing during Detroit’s 1967 civil disorder? 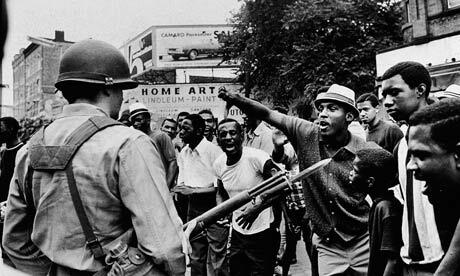 If you had a “significant, first-hand experience” with the uprisings in the last week in July that year, the Detroit Historical Museum wants to hear your story for an oral history project it’s conducting in the run-up to the riot’s 50th anniversary next summer. The Detroit museum will have interviewers on hand to record your recollections this Saturday, Aug. 20, between 10 a.m. and 3 p.m. The stories will become part of the museum’s “Detroit 67: Looking Back to Move Forward,” which seeks to assemble a record of what Detroiters and suburbanites were doing during one of the most momentous weeks in Detroit’s 315-year history. More than 200 people already have recorded their histories, which can be read here. The histories will become part of the museum’s permanent collection. “We want to make them accessible to the public and to have it as a source for scholars who are writing about this period,” said Tobi Voigt, the museum’s chief curatorial officer. Girard Townsend told an interviewer that he took part in the mayhem, and he isn’t proud of that today. Anthony Fierimonte was a member of the Detroit Police force who participated in the early Sunday-morning raid on a so-called blind pig (after hours drinking and gambling room) that touched off a week of chaos that left 43 dead, more than a thousand injured and millions in property damage. Fierimonte recalled he returned with prisoners to the local precinct and told a superior he needed to respond to 12th Street and Clairmount, the intersection where looting had started. Joseph Claxton was sitting on his porch on French Road on Detroit’s east side when national guard troops appeared on the block with tanks. The guardsman relaxed, but Claxton was rattled. “That was a very hairy experience,” he said. Interviews will be conducted at the museum, at Woodward and Kirby in Detroit’s Cultural Center, and will last 30 to 45 minutes. They must be scheduled ahead of time by calling the museum at 313-833-7912; or sending an email to detroit1967@detroithistorical.org. Had no significant first hand experience, just coming back to the Lansing area from watching a Tigers game and noticed a lot of fires and smoke while on the John Lodge expressway. One building fire was right next to the freeway and I remember seeing the flames shooting out from it. Had no idea what was going on because of a news blackout (that wouldn't work these days with social media). When we got back to Lansing we found out what was going on and were grateful we managed to get out safely. We live in Flint. We owned a Buick 225 convertible which was parked in front of our home. In the middle of the night, somebody drove by and threw a cherry bomb onto the fabric top of the car and blew it up. The car was totaled. The worst part was we had young children who were frightened to death & as adults still talk about the horror of the incident.